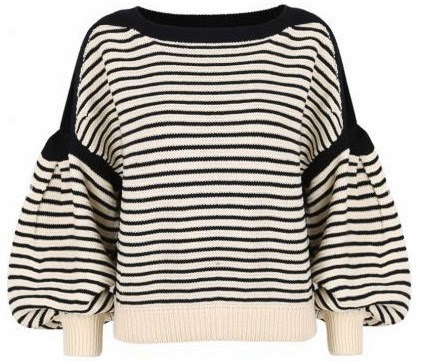 This bubble-sleeved striped sweater makes morning-to-evening chic as easy as can be. Bought the sweater, what you don't see is there are slits at the shoulders. So if you plan on wearing it for the winter, cold shoulders brrrr. Runs small, cropped, and the quality is not great. However, compared to prices of some of the clothing recommended, it is an affordable site for the latest fashion. I bought it too and have been wearing it with high-waisted pants and have gotten lots of compliments. It's great--esp for $32!